You’ll find just a handful of boutique hotels in Aruba. They come in different sizes and styles, atmospheres and price ranges. They are small and often luxurious hotels, that combine a hip interior design with a refined service, which has been a new trend of the last few decades. Instead of choosing for a stay in a resort in Aruba, more and more visitors have opted for a stay in an accommodation in boutique style. Many Aruba boutique hotels are truly one of a kind, offering visitors to the island genuine comfort, intimacy, and true Caribbean originality. This unique mix contributes to a satisfying and an unforgettable vacation in Aruba. The Boardwalk Small Hotel is one of three recommended small hotels in the Caribbean according to National Geographic Magazine. You’ll find it just 200 meters from the renowned Palm Beach, on an old coconut plant behind a few Marriot high-rise resorts. The family-run hotel has recently been renovated, and all casitas have recently been completely refurbished to give them a typical island style with bright Caribbean colors that contrast beautifully with the blue Aruban skies. The Boardwalk Small Hotel offers just 14 rooms in total, ranging from studios to cozy one- and two-bedroom cottages. 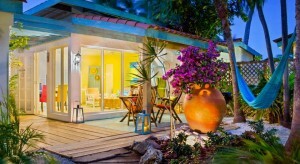 Painted in sunny Caribbean colors, all cottages have air-conditioning and a living and dining area. If you’d like to cook yourself, the cottages have a modern fully equipped kitchen with cookware and dishware. The nearest supermarket is just 1 kilometer (0.6 miles) away. At the Boardwalk Small Hotel, both WiFi and parking are free. Snorkeling equipment can be borrowed from the hotel, to be used at the nearby Arashi beach – a perfect spot for admiring some tropical fish. 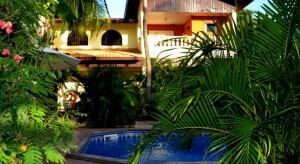 The hotel’s outdoor facilities include a BBQ, an outdoor pool, a garden, and a terrace. The Boardwalk is the only boutique hotel in Aruba where children are allowed: children under 12 years old can stay for free when existing beds are used. Although not officially advertised as a boutique hotel, the MVC Eagle Beach Hotel is small and cozy enough to deserve a spot on our list. Located just a few steps from Eagle Beach, this small beach hotel was built in a boutique style and has just 19 rooms, 3 of which are suitable for families. Outdoor facilities include a freshwater outdoor pool, a tennis court and there’s a jogging trail near the hotel. All newly decorated rooms are smoke-free, air-conditioned, and have a king-sized bed, a flat-screen TV, and an outside terrace seat. The hotel has an on-site restaurant and there are several restaurants, nightlife venues, and shops nearby at a walkable distance. The small beach hotel is just a 10-minute drive from Oranjestad and a 15-minute drive from Reina Beatrix International Airport. You’ll find the Wonders Boutique Hotel just 2 kilometers from the center of Oranjestad. It is one of the smallest Aruba boutique hotels, as it features just 8 rooms ranging from deluxe king rooms, studios with a terrace, superior king rooms, and king rooms. All rooms offer air conditioning, a flat-screen TV, a small fridge, and a minibar that is restocked with wines and sodas every day. Outdoor facilities include an outdoor pool which is fed by a natural spring, a garden, terrace, and sun terrace. Eagle Beach is just 10 minutes away, and the hotel offers a free daily shuttle service to Eagle Beach and Palm Beach. WiFi is free for guests, and a free private parking area is available at a nearby location. Beach towels, lounge chairs at Palm Beach and snorkeling gear are free of charge. This boutique hotel is a little adults-only heaven for everyone who just likes to relax in a casual yet luxurious environment! Just minutes away from Surfside Beach and Oranjestad, Talk of the Town Hotel & Beach club is a casual boutique hotel offering 62 fully-equipped rooms and suites. It has recently been renovated, redefining its charming, intimate and inviting character. Talk of the Town Hotel & Beach Club has a rating of three stars. Breakfast and free parking are included when you make your arrangements here. Top facilities include a new pool with a poolside bar called the Moonlight Bar & Grill, the Gazebo Restaurant, and a courtyard. 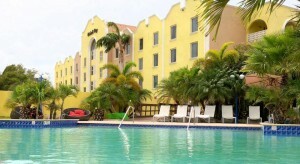 From this hotel, it is easy to visit downtown Oranjestad to go shopping, dining or just go out for a drink. You’ll also enjoy taking a stroll along the pier. At Pincho’s Grill & Bar you can enjoy wonderful sunsets at the end of the day while sipping on a cocktail or observe the cruise ships entering and leaving the Aruba port from time to time. You will appreciate the low-rise character of the hotel that has been in Aruba for many years! With 98 rooms, the Brickell Bay Beach Club & Spa is one of the bigger Aruba boutique hotels. Located right at Palm Beach and only a 15-minute drive away from Queen Beatrix International Airport, this three-star hotel offers a large variety of rooms including superior triple rooms, two-bedroom suites, deluxe triple rooms, and deluxe rooms. All modern rooms feature a flat-screen TV, an iPod dock, and a work desk. You’ll find plenty of restaurants and bars in the surrounding high-rise hotel area, though the hotel has on-site restaurants available including a Chicago-style pizza restaurant. WiFi and parking are free for guests of the hotel. Note that the Brickell Bay Beach Club & Spa is adult-only. Of all the Boutique boutique hotels in Aruba, the adult-only Bucuti & Tara Beach Resort is the only accommodation that offers a four-star boutique experience. It is located right at the widest and most secluded part of the renowned Eagle Beach, one of the best beaches of the island. The award-winning and eco-friendly beach resort is an intimate getaway for couples in search of relaxation and romance, away from the busier high-rise hotels. All 104 rooms at Bucuti are non-smoking and have air purifiers. They range from Standard and Superior Rooms with a garden view to the romantic oceanfront Tara Suites with a separate bedroom and a living room with TV, minibar and microwave. At Eagle beach, guests will enjoy Bucuti’s signature beach service and enjoy dining at one of three on-site dining facilities including the recently opened ‘Elements’ restaurant – Aruba’s first restaurant that serves a combination of world cuisine, organic and natural, gluten-free, and vegan/vegetarian dishes. 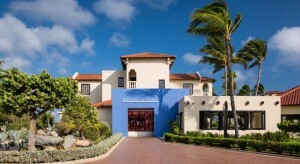 The Ocean Z is the only five-star boutique hotel in Aruba for adults. It boasts ultimate privacy and a minimalist design. The iconic hotel was designed by a Venezuelan architect, who’s famous works include the church of Santa Rosa de Lima and the Concert Hall in Caracas, the capital of Venezuela. 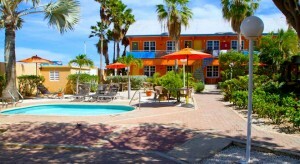 The Ocean Z offers just 13 rooms, spread across two adjacent buildings. The hotel’s luxury suites feature spectacular ocean views and an infinity pool. Double rooms are elegantly furnished and have a size of over 400 square feet. A private outdoor shower with a deck will keep you cool. The hotel is located right on Aruba’s renowned Ocean Drive, just steps away from Boca Catalina, Malmok and Arashi Beach, some of the best beaches of the island. Top facilities include a gourmet restaurant and a convenience store. Upon arrival, the hotel’s multilingual staff will take care of your transfer, arrange your car rental and welcome you with a glass of champagne.